Cherrystone Auctions has opened a“Gallery of Rarities” section of their website where stamp enthusiasts can view information about the rarest and most valuable stamps sold by the New York City auction house. The gallery includes nearly 400 rare stamps sold through Cherrystone over the years. Visitors to the Gallery of Rarities are able to click on a specific stamp and view an enlarged image. Detailed information accompanies each stamp in the gallery, including the year it was released, the year it was sold and the price it realized at auction. Users of the interactive gallery are able to sort through the collection of rare stamps from around the world by country of origin or by price realized. The Gallery of Rarities includes stamps and stamp-related collectibles from the United States, Russia, Canada, China, Italy, Iceland and other countries. Sorting the stamps by the price they realized at auction reveals that the highest-price item in the Gallery is a complete pane of 25 Russian stamps released in 1924 and sold in a Cherrystone auction in June of 2008 for $805,000.00. The highest-priced American stamp in the Gallery—a 24-cent stamp from 1918—was auctioned off by Cherrystone in December of 2010 for $345,000.00. 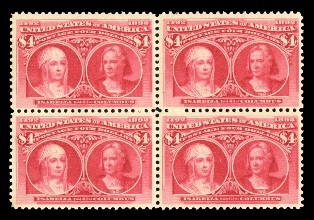 Cherrystone notes on their website that there may be many stamps that look similar to those in their Gallery of Rarities. Often times, the auction house explains, the very subtle differences between rare stamps and common stamps can be determined only by experts. Cherrystone Auction’s Gallery of Rarities, https://www.cherrystoneauctions.com/gallery.asp , is found on their website, listed below, under the “About” section at the top of the page. Cherrystone Auctions was originally founded as a retail store in 1967. Since then, it has evolved for over 49 years into one of the world’s leading auctioneers of rare stamps and philatelic material. Located in the heart of New York City, Cherrystone is a member of all major United States and European Philatelic Societies, among them are ASDA, APS, U.S. Philatelic Classics Society and Collectors Club of New York. The auction house brings over $30 million worth of stamps and postal-related collectibles to market each year. Their auctions, held on a consistent basis several times per year, feature stamps from around the world of particular rarity and quality. In addition to auctions, Cherrystone occasionally holds “Specialty” sales, often the award-winning collections of single owners. Among these famous collections auctioned off by Cherrystone were the Garfield Collection of United States Postal Stationery, the Andrew Cronin Collection of Worldwide Postal History and the S. Shtern Collection of the Soviet Union. Cherrystone’s leadership staff includes Paul Buchsbayew as President and Joshua Buchsbayew as Vice President. The leaders credit the auction house’s success to a combination of decades of experience in the business and personal passion for stamps. Paul is a member of the A.I.E.P. (Association Internationale des Experts Philatelie) and an expert in Russian material while Joshua’s primary interest is in United States Classics. Parties interested in selling their collections through Cherrystone or who have questions about how to purchase from the auction house are encouraged to contact Paul or Joshua directly. More information about Cherrystone Auctions and its upcoming auction on August 9th and 10th is available on their website.